PHILADELPHIA — As the ultimate “sports guy,” I’ve always enjoyed women’s athletics, but it seems like, the older I get, the more appreciation I have for the women who perform their various athletic feats of amazement in a multitude of sports spread across the globe. From the time I was just a youth, I can remember being mesmerized by the jaw-dropping performances of Cheryl Miller and later, my personal favorite, Dawn Staley. My point is, that, although women’s athletic events don’t generally receive the same amount of heaping media coverage that most men’s events garner, that fact doesn’t lessen their legitimacy or greatness one iota. In honor of some of the greatest women to ever participate in professional sports, I have decided to put together a list of the 10 greatest African-American female athletes ever. Of course, this is just one man’s opinion, so readers are encouraged to contact me with their own respective lists and comments, many of which will be published at a later date. Now enough with the small talk, let me get busy. With all of the incredible female athletes to ever participate in any sport, I found it amazingly easy to put Joyner-Kersee in this spot. Joyner-Kersee, who was often described as “the best all-around female athlete in the world,” was an amazing athlete who overcame her asthmatic condition to establish herself as one of track and field’s most competitive and determined performers ever. In 1988, she won two gold medals at the Olympics in Seoul, Korea exhibiting incredible will power in the heptathlon (a punishing, two-day contest that tests an athlete’s strength, speed and stamina) and the long jump. 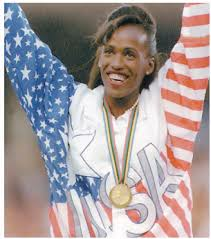 In the 1992 Games in Barcelona, Spain, Joyner-Kersee retained her title as the “world’s greatest female athlete” with another gold medal performance in the heptathlon. The two-time world champion in both the long jump (1987, 1991) and heptathlon (1987, 1993) was also the 1986 recipient of the Sullivan Award, presented to the nation’s top amateur athlete. Joyner-Kersee was also an excellent basketball player who routinely competed with many of the game’s best players in her free time. I looked long and hard at putting another athlete in this spot, but I just couldn’t do it. The thing I kept coming back to is the fact that I truly believe that Joyner-Kersee would have been a world-class athlete in whatever sport she chose to pursue. Long before becoming the world’s fastest female, Rudolph beat her greatest odds by learning to walk on her own. As a child, Rudolph (the 17th of 21 children) was afflicted with polio, scarlet fever and double pneumonia and grew up wearing a brace on her right leg. To everyone’s shock, she removed the brace and walked unassisted at age nine. By age 13 she was outracing all of the kids in her neighborhood – including the boys. By 16 she had qualified for the 1956 Olympics where she won a bronze in the 4×100-meter relay and in Rome four years later, she became a nationally beloved figure when she won the 100 and 200 meters and 4×100. Rudolph was also an outspoken Civil Rights advocate who participated in sit-ins at “whites-only” restaurants, ran a community center and established the Wilma Rudolph Foundation, which sends schools tutors and books about American heroes – a category that surely includes the incomparable Wilma Rudolph. Not only is Rudolph one of the finest athletes ever ï¿½ but I firmly believe ï¿½ one of the worldï¿½s finest human beings as well. 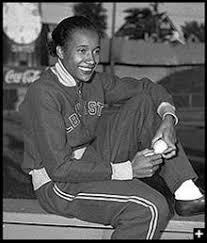 First of all, let me say that I found it disturbing how few people that I talked to knew about Alice Coachman and her athletic accomplishments. Coachman leaped into history when she became the first Black woman to win a gold medal, following a record-setting performance in the high jump at the 1948 Olympics in London. Because Coachman dominated the high jump for a decade, many sports fans believe the Tuskegee Institute (now University) star, who also was a top sprinter, probably would have won more medals if the 1940 and 1944 Olympics hadn’t been canceled because of World War II. She won the AAU outdoor high jump championship from 1939 through 1948, and she was indoor champion in 1941, 1945 and 1946. There was no indoor competition from 1938 through 1940 or from 1942 through 1944. Iï¿½ll say this about Coachman. Had she competed in those canceled Olympics, we would probably be talking about her as the number one female athlete of all-time. As it stands, her accomplishments were good enough to make her one of the finest athletes ever and earn her the number three spot on this list. Although I have Miller ranked fourth on this list and the first basketball player to make the list, I don’t know if I can necessarily say that Cheryl Miller is the best female basketball player ever. Weird, huh? That’s what I initially thought as well. But here’s what I came up with. Miller is ranked this high on my list because she is one of the greatest female basketball players ever. Not only that, but her “in-your-face” aggressive style of play altered the women’s game forever and lifted its popularity to heights that had never been seen before. Miller was a four-time All-American in high school and once scored 105 points in a high school game. After enrolling at the University of Southern California, she became a four-time All-American, and for three consecutive years, she won the Naismith Award as the nation’s outstanding female basketball player (1984-1986). She finished her collegiate career with averages of 23.6 points per game and 12 rebounds per game, and was the first basketball player at USC–male or female–to have a jersey number retired. In addition to her Olympic achievements, Miller also starred on the United States national basketball teams that won gold medals at the 1983 Pan American Games in Caracas, Venezuela, and at the 1986 Goodwill Games in Moscow. That same year, she was drafted by several professional basketball leagues, including the United States Basketball League, a men’s league. Injuries shortened Miller’s career but in 1995, she was inducted into the Basketball Hall of Fame. So, in the end, although I’m a little more partial towards either Dawn Staley or Cynthia Cooper as the greatest female basketball player of all-time, Miller earned this spot with both, her on-court and off-court contributions to the game. I don’t think there’s ever been a better leader or winner in women’s basketball than Cynthia Cooper, who, for all intents and purposes, was the female equivalent of Michael Jordan. Cooper became the standard bearer for the WNBA and helped establish it as a thriving league, which is now considered to be the ultimate showcase for professional female basketball players. After leading the University of Southern California to two championships (1983-’84) and winning a gold medal with the U.S. Olympic team in 1988, she excelled in the European leagues before returning to the U.S. to join the Houston Comets during their inaugural WNBA season. Cooper was a two-time league MVP with the Comets and led the team to four championships and was named playoff MVP in each of those years. She was the first to reach the 2,500-point plateau and held WNBA records for scoring in a single-game and for the season. When I sat down to write this column, there was absolutely no way I would have ever thought Althea Gibson wouldn’t be in my top three of all-time female athletes, but I get paid to call it like I see it and this is the way things shook out. At any rate, Gibson, who was the first African-American to win Wimbledon, brought grace, dignity and power to the world of tennis in the 1950’s. She intimidated opponents with her powerful serve, pinpoint volleys and thundering overhead. But she is best remembered for having the courage to take on major tennis’ all-white establishment. Gibson was a pioneer who broke several racial barriers in the sport and paved the way for future stars such as Arthur Ashe, Zina Garrison, and Venus and Serena Williams. The first African-American to win the Wimbledon singles title (she did it twice, in 1957 and 1958), she also won the French Open and U.S. Open singles titles. During the summer of 1941, a Police Athletic League supervisor watched Gibson win a local paddleball tournament and suggested she take up tennis. Gibson began taking lessons, beating all comers and rapidly rising through the ranks of New York’s all-Black American Tennis Association (ATA). In 1947, Gibson won the first of her 10 consecutive ATA national championships. She continued to dominate the ATA circuit while remaining shut out of all-white United States Lawn Tennis Association (USLTA) events. After years of lobbying on the part of ATA officials and contemporaries such as former Wimbledon champion Alice Marble, Gibson made tennis history when she stepped onto Court 14 at the West Side Tennis Club in Forest Hills, New York on August 28, 1950 to compete in women’s singles at the U.S. Championship. Gibson became the first African-American — male or female — to play in a major USLTA event. She defeated England’s Barbara Knapp in straight sets, but lost to former Wimbledon champion Louise Brough in the second round. She made history again at Wimbledon that year, advancing to the quarterfinals. Gibson was nearly 30 when she won her first Wimbledon title in 1957. She returned to a hero’s welcome and ticker-tape parade in New York. She won her first U.S. Championship later that year and became the top-ranked female tennis player in the world. After winning her second U.S. title in 1958, Gibson retired from competition. She took up golf and broke another color barrier by becoming the first African-American woman to compete on the LPGA circuit. She won one tournament during a seven-year career. After retiring from professional competition in 1971, Gibson taught tennis and also served as athletic commissioner for the State of New Jersey from 1975 to ’77. She was inducted into the International Tennis Hall of Fame in 1971 and to the International Women’s Sports Hall of Fame in 1980. Florence Griffith-Joyner, who set world records in the 100 and 200 meters, was not alone among athletes in burning herself into public memory. But she was alone in her sport. In 1988 she burst into the spotlight, having transformed herself from the workaday sprinter who had won silver in the 200 meters at the boycott-thinned 1984 Olympics into the fastest woman in history. 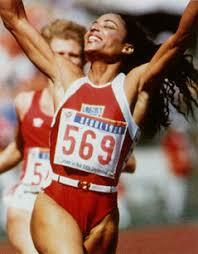 She ran the 100 in 10.49 seconds in 1988, a world record that wasn’t even approached for a decade. The sister-in-law of Jackie Joyner-Kersee, “Flo-Jo” won three gold medals at the ’88 Games and set a world record of 21.34 in the 200. A decade later, long retired but still a vital personality, she died of a heart seizure. It wasn’t simply speed that formed Flo-Jo’s legend, but also style. She wore one-legged unitards and lace attachments when other women wore shorts, melding athleticism and glamour like no one else. Incredibly, a lot of people I spoke with didnï¿½t even have Staley in their all-time top 10. All I can say is that they must have never seen her in play person. I watched Staley play and played against her when she was a teenager at Dobbins Technical High School near my old North Philadelphia neighborhood. I also followed Staley through college and even overseas and then back to the U.S. and Iï¿½m telling you, there arenï¿½t many finer ï¿½ or tougher ï¿½ athletes around ï¿½ male or female. After being named the national high school player of the year during her final season at Dobbins, Staley attended the University of Virginia and led her team to four NCAA Tournamentsand three Final Foursand one National Championship game. She was named the national player of the year in 1991 and 1992 and finished her collegiate career with 2,135 points and holds the NCAA record for career steals with 454. In 1996, she joined the Richmond Rage of the American Basketball League (ABL) and led the team to the finals in 1997. In 2001, she led the Charlotte Sting of the WNBA to the Championship game of the WNBA playoffs. Staley also played overseas in France, Italy, Brazil and Spain before joining the WNBA. She also played for team USA throughout her career and won three Olympic Gold Medals. She led the 1996 team to an undefeated record of 60-0 and the gold medal at the Olympic Games in Atlanta. In 1994 she competed in the World Championships and was named the USA basketball Female Athlete of the Year. She was also a member of the 2000 Olympic team that defended the gold medal and won a third gold medal at the 2004 Gamess in Athens. Her Olympic performance lead to her being named 2004 USA Basketball Female Athlete Of The Year and also helped her land a role carrying the US flag during the parade of nations at the opening ceremony. After the 1999 college basketball season, Temple University named Staley the head coach of its women’s basketball program and she reached the 100th win plateau in the A-10 Semifinals vs Xavier, becoming the fastest coach in women’s basketball to achieve that. Staley is also a fine woman off the court and started the Dawn Staley Foundation to help area youths. I know sheï¿½s not as dominant as she once was and that frequent injuries and advancing age may never let her be the player that she once was, but Venus Williams is hand-down one of the ten greatest black female athletes ever. While I also realize that her sister may be more athletic and talented ï¿½ and an even better tennis player ï¿½ I feel that Venusï¿½ edge in mental fortitude ranks her slightly higher on this list than her sister, who is a wonderful athlete in her own right. At any rate, I have Venus in this spot and Iï¿½m sticking to my guns. I mean itï¿½s not like sheï¿½s chopped liver or something. In 20000, she won the Wimbledon championship and the U.S. Open in singles and defended both titles the following year. In 2002 and 2003, Venus reached five majorfinals but lost all of them to her sister including the 2003 Wimbledon finals she competed in despite suffering a severe abdominal injury which required medical attention during the match. Williams also won two Gold medals at the Sydney Summer Olympics in 20000 and the 1999 French Open doubles with Serena as her partner, and five other doubles and two mixed doubles grand slams. When Venus and Serena won the 1999 French Open doubles title, they became the first pair of sisters to win a doubles title in the 20th century. What did the trick for me in putting Venus over her sister however, was the 2005 Wimbledon finals, which she reached without dropping a set. She defeated the defending champion Maria Sharapova in the semifinals in straight sets with a skillful display of speed, athleticism and power, breaking Sharapova’s serve four times. In the longest Wimbledon final in history, Venus overcame a match point against her to triumph over top seed Lindsay Davenport 4-6 7-6(4) 9-7 to claim the 2005 Wimbledon Championship – her third Wimbledon title in six years. That was also the first time in 70 years that a player had won after facing match point during the women’s championship. In addition, Williams, as the 14th seed in the draw, was the lowest seed to win the title in Wimbledon history. I know I have her ranked one spot below her sister even though she was a better player than her sister. 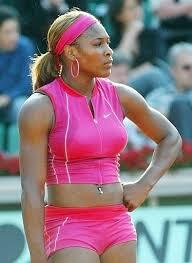 However, Serenaï¿½s athletic gifts probably should have taken her to unprecedented heights in tennis. Her admitted lack of any work ethic prevented her from becoming the greatest female tennis player of all-time, which she clearly could have become. Whatever the case, Serena still was good enough to become the most successful African-American female tennis player of all-time and one of the greatest female athletes ever. In 1999, Williams, the former number one player in the world, won her first Grand Slam tournament when she won the US Open and also became the first African American woman to win a Grand Slam tournament since Althea Gibson in 1958. In 2000, Williams won the doubles gold medal at the Olympics with sister Venus. In 2002, she won the French Open, Wimbledon, and the US Open. She finished the year with a 56-5 record and 8 titles, arguably becoming the most dominant female in Tennis at the time. She also stayed number one for a year and during that year won 5 of her 7 Grand Slam Titles. She also reached the final of the WTA tour championships for a second time before losing to Kim Clijsters. She also won the Wimbledon doubles title with her sister Venus for the second time. In ï¿½03, she won the Australian Open, her fourth straight Grand Slam singles title, becoming only the ninth woman ever to win all four Grand Slam events. Her accomplishment was dubbed the Serena Slam. Williams withdrew from the Australian Open in 2004 to continue rehabilitating her left knee but reached the final of Wimbledon once again. However, she lost to 17-year-old Russian, Maria Sharapova. In 2005, she won her seventh Grand Slam event, winning the Australian Open, but has been nothing more than a blip on the radar ever since. Williams may not be done setting her legacy, but even if she never wins another match, Serena has proven herself to be a champion through and through. Like Dawn Staley, Cheryl Miller and Cynthia Cooper, Leslie has come to define excellence in womenï¿½s basketball. A mainstay on USA Basketball teams since being named to the 1989 USA Junior World Championship Team as a high school senior, Leslie has been a member of nine USA Basketball gold medal winning teams, earning top honors at the 2004, 2000 and 1996 Olympic Games, 1999 U.S. Olympic Cup, 1998 and 2002 FIBA World Championships, 1994 Goodwill Games, 1993 COPABA World Championship Qualifying Tournament, 1992 R. William Jones Cup and 1991 World University Games. Leslie closed out her third and possibly final Olympic competition ranking as the USA’s all-time leading scorer, rebounder and shot blocker after compiling 407 points, 185 rebounds and 25 blocked shots in the three Olympic Games. She has also posted double-digit scoring averages in every major international event she has competed and boasts USA Basketball career averages of 16.0 ppg. and 6.9 rpg. During her 14 years with USA Basketball, Leslie has etched her name throughout the USA Basketball record books. On the World Championship stage, Leslie ranks first among all-time USA World Championship leaders in points (393) and rebounds (190) and ranks second in blocked shots (17). Leslie was signed by the WNBA and assigned to the Los Angeles Sparks on Jan. 22, 1997. In her first seven years with the Sparks, Leslie helped the Sparks to a 151-69 overall record, including a 28-4 record in 2001, and a pair of WNBA titles. En route to the ï¿½01 championship, Leslie averaged 22.3 ppg., 12.3 rpg., 4.4 bpg., and 3.0 apg. in the playoffs and recorded 35 points, 16 rebounds, seven blocked shots in the Sparksï¿½ 93-62 victory over the Charlotte Sting in the final contest. Earning WNBA Most Valuable Player honors in 2001, Leslie capped the year with the 2001 WNBA Finals MVP award. Leslie finished the 2002 season as one of only two players to average a double-double after posting averages of 16.9 ppg. and 10.4 rpg. in leading the Sparks to a 25-7 record and a first place finish in the Western Conference. She also hit a major milestone in 2002, becoming the first person to dunk in a WNBA game after doing so against Miami on July 30, 2002. Averaging 19.8 ppg. and 8.0 rpg. throughout the playoffs, Leslie again collected WNBA Finals MVP honors after leading the Sparks to their second straight title. A five-time WNBA All-Star, Leslie earned 1999, 2001 and 2002 WNBA All-Star Game MVP accolades after helping the Western Conference to victories over the Eastern Conference. Additionally, Leslie has been named to the All-WNBA first team (1997, 2000, 2001, 2002, 2003) or All-WNBA second team (1998, 1999) in each of the league’s seasons. White, who may be even less remembered than Coachman, was a two-time Olympic silver medalist and a consistent model of athletic excellence as a member of an incredible five U.S. Olympic teams–1956, 1960, 1964, 1968 and 1972. She won her first silver medal in the long jump in 1956 in Melbourne, Australia. At the 1964 Games in Tokyo, she won another silver medal as a member of the 4×100-meter relay team. In addition to her Olympic achievements, she was a member of – and medalist on – four Pan American teams. In 1959, she set an American long jump record that stood for 16 years. White is a member of the National Track and Field Hall of Fame, the National Association of Sport and Physical Education Hall of Fame, the Black Sports Hall of Fame, the Women’s Sports Foundation Hall of Fame, the Chicago Sports Hall of Fame, the Helms Hall of Fame, the Mississippi State Hall of Fame and the Tennessee State University Hall of Fame. So there you have it. My top 10 list of all-time great black female athletes. If yours varies, please feel free to send me an e-mail and your comments may be posted in a later column.